The Stamford Brasserie is an all-in-one dining destination that brings to life the charm and exuberance of a classic French brasserie. 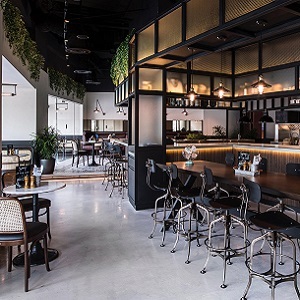 The stylish tri-concept outlet, first in the hotel to run completely plastic-free, is conveniently located on the ground floor of Swissôtel The Stamford and comprises a Grab-and-Go, All-day Dining Restaurant and Beer Bar. A perfect refueling stop in the heart of the city, will love the welcoming ambience and versatility of the Brasserie at different times of the day. With its diverse menu options, from robust coffees and fresh hearty meals on-the-go to home-style bistro favourites and satisfying craft beers in an intimate yet cheerful setting, The Stamford Brasserie is the ideal fit to one’s daily routine. I was hosting a business lunch on Tuesday, 16 April at Stamford Brasserie. We were there at about 12.30pm. I was very embarrassed that service was dismal. We asked for water 4 times with 3 different waiters. My main arrived about 45mins after our order but his main never came even after reminders to 2 waiters repeatedly. At 2pm, there was still no main dish. He decided to cancel the order and we left. Let me add that the waiters were pleasant and apologetic. But food not arriving more than an hour after the order is simply just not acceptable. And this after repeated requests. The staff service are great! Will definitely return for the food and ambience, as well as recommend to my friends about this place. Thanks for creating such a wonderful experience! on a Friday night at prime time, one of the waitresses was very rude and inattentive, she showed bad attitude when serving us and placed our glasses loudly onto the table with no eye contact as if she hates her job. The supervisor was really good to turn the situation around by apologising and compensating us with a cake. Food was good overall! Overly done wagyu when medium was requested. Stale chips. Overcooked bbq pork ribs, hard and not juicy. Mediocre bbq sauce. Went for dinner on a weekday night. It was difficult to get the attention of the service staff, even though the restaurant was not full. Food (mains) was not hot when they arrived, they were warm at best. A convenient place to dine at if you're in the vicinity, but not somewhere I would make a conscious effort to go to. The food and atmosphere was great! Enjoyed my beef cheek with mash potato - was very succulent and delicious. My friends enjoyed their dishes as well! Was pleasantly surprised by the staff who offered to take a photo for our group after all the food was served! We shared that the waffle fries tasted stale and was subsequently replaced with what we thought were freshly cooked fries. Upon tasting, they tasted refried instead. Burger patties were also dry. Beef cheeks were good though and it was kind of the staff to offer a dessert to celebrate a family member’s birthday. We ordered beef cheek. The portion is a liitle too little. The mashed potatoes and fried vegs were nice. For the BBQ pork ribs, it doesn't taste like it's barbequed. We prefer the honey bbq type. The communal platter serves a fairly large portion of foie gras. All in, the 3 plates were sufficient for 4 of us. Excellent service with complimentary mango tart upon mentioning of birthday celebration. Excellent lunch experience with very friendly service and classic bistro ambience designed around an open kitchen concept. Food was excellent, too - including the dessert chosen from the patisserie. Overall great experience - value for money was also good given the Accor dining card discount provided. Great choice for business lunch and casual, but classy dining. The food was great, especially the chicken and mushroom soup. The set was value for money. Excellent service from the servers. The only thing is the reservation on the phone was a little tedious. Staff (Giselle) was very friendly and accommodating due to our last minute reservation for a birthday celebration. Delicious food, lovely atmosphere and impeccable service. Highly recommended! Food was great and atmosphere was alright. But our experience at the restaurant was tainted by the poor service that night. Service was extremely lacking. The aircon vent was leaking but nothing was done. We also had a hard time trying to get the attention of the service crew, who seemed to be more prompt in responding to the Caucasian customers at the surrounding tables. In general I feel that the drinks is better than the food. I have been to stamford brasserie for drinks a few times n am happy to go for drinks. The food on the other hand has been quite disappointing. We had the country pie which was rather dry, the pork ribs and the beef cheek taste ok but seemed to be precooked and reheated and causes the meat to be tougher on the outside. If the chef can provide improved quality of the food it wil be so much better. Need to improve in the main course. The meat of the roasted chicken & the bbq pork ribs were quite tough. We hope to see tender & juicy chicken/duck/lamb/fish in the main course menu. The service was exceptional and the food was delicious. Perfect for my Valentine's meal! I have been there twice and both times are great experience in terms of food, service and atmosphere. Nice ambience with good food! Waited 2hrs for all of our food to be served although other customer who came later than us are done and billed. 3 Servers that I approached mentioned kitchen was jam packed with orders and thus our orders were being mixed and held up. Was very disappointed on the waiting time even thou we were served desserts to make up for the long waiting time. I enjoy dining at The Stamford Brassiere. Casual ambience, good food and friendly staff.